We recently received this photo from our friend and trusted advisor, Prof. Billy Kniffen of the Texas A&M AgriLife Extension Service and former President of the American Rainwater Catchment Association. Billy has been advising us on the design and marketing of our product since we started in 2010. We gave Billy a RainSaucer recently and of all the many applications possible, he decided to use it as a bird bath. According to Billy "Attached is the RainSaucer to (a Moby) Rain barrel that has a lid sloped just the same as the saucer. It is being used with a bird bath and adjustable drip emitter to keep dripping by gravity about 1 drop per second. 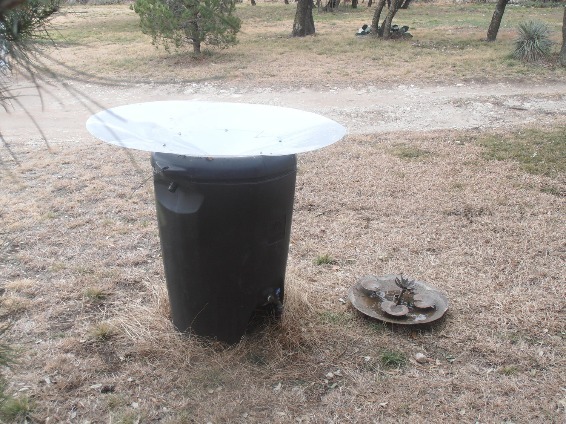 Here in Texas with high winds, the saucer is screwed down to the lid and makes it very strong. " Billy's application mirrors that of a larger opportunity in Rainwater Harvesting: the use of collected rainwater for attracting wildlife. All it takes is a method of harvesting the rain, an appropriate sized water storage system, and a watering device to dramatically increase the presence of animals in a given land area. More animals means greater possibilities for tourism, hunting, or animal study. In some States, there is also the possibility of receiving grant money or a reduction in property taxes because of wildlife habitat creation. Similarly, the same setup can be used for watering of livestock. This is especially useful with animals that range over large areas such as goats and sheep. Supplemental water sources located throughout a land area can diversify and lengthen the animals' grazing range and keep them better fed and hydrated.